Heat recovery is a ventilation system that employs a counter-flow heat exchanger between the inbound and outbound air flow. HRV provide fresh air and improved climate control, while also saving energy by reducing the heating requirements. 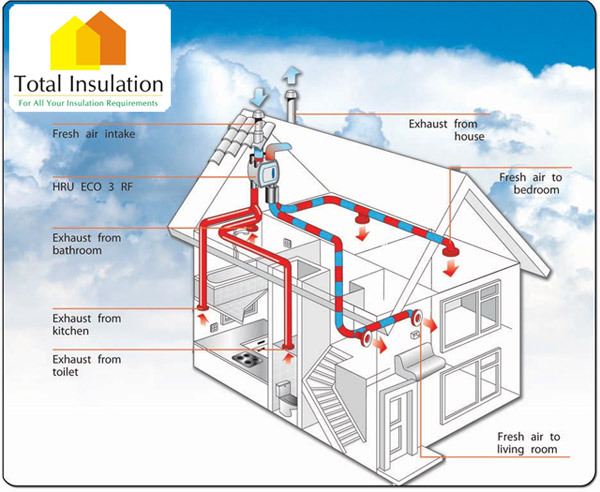 This system is particularly suited to Airtight Houses. The system provides quiet, uninterrupted extract ventilation from the dwelling, removing warm stale air via all of the “wet” rooms, creating a permanent air path through the property from the “dry” habitable rooms. Air, drawn into the property by the fan is routed through an integral high-efficiency synthetic heat exchanger where warmth from the extracted air is transferred to the incoming fresh air before it is supplied to the habitable rooms. In employing this type of system, there is no need to install background ventilators in the dwelling – an ideal solution to “noisy” sites. To counter increased pollutants caused by cooking or bathing activities, a wireless boost facility allows the fan's balanced extract and supply rates to be increased from anywhere in the property where an RF Switch is positioned. Healthy Home: less pollen, less allergies and less dust mites. Comfort: constant fresh air supply all day everyday. Helps limit and eliminate Radon build up. Quieter home as windows can be kept closed. No individual fans extracting costly heated air directly outside. No fungal or mould growth in bathrooms and bedrooms. Extra security as windows can be kept securely closed.